It seems like every year, there’s a brawl over some choice item during Black Friday sales. And it appears 2015 is no different. The clip was uploaded the clip to YouTube on Friday. It’s unclear where the footage was shot. “This lady stole a veggie steamer from a KID on Black Friday! Shame,” the YouTube uploader wrote on the page. The uploader claimed the clip was shot in “Sagninaw,” without elaborating much more. They immediately threw themselves into a pile of vegetable steamers. “Why are you being so oppressive? You’re scaring me!” the woman screamed as the child’s mother fought back. The child’s mother was holding two steamers of her own. “I feel like this is fake and somehow Jimmy Kimmel is behind it,” a skeptic wrote on YouTube. As the Daily News noted, the steamer thief was already inside the store and wasn’t part of the stampede. Another video shows a man in Texas swinging wildly at a police officer during a fight, the New York Daily News noted. Meanwhile, shoppers fought at a mall in Louisville, Kentucky, mall on Thursday evening. The wrestled each other on the ground. The fight also knocked down a woman to the floor as shoppers at Mall St. Matthews looked onward. A police officer broke up the brawl. It’s unclear what triggered the two to fight. Another fight was captured at “Florence Mall,” as some users on Twitter claimed. The men came to blows as many more looked on. In 2008, a Walmart worker was killed as shoppers trampled him to death during Black Friday shopping. 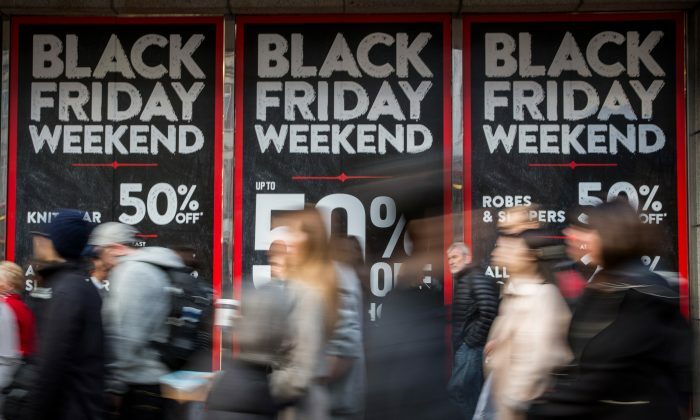 A survey estimates that nearly 100 million–or 99.77 million–Black Friday shoppers will come out during 2015. Another report also ranked the top states that are likely to experience fights during Black Friday: Arkansas was No. 1, Tennessee was No. 2, and Alabama was No. 3.